Some times I feel like Madonna in the Pokémon world. A bit older than the other starlets, yet still cranking out the hits. Doing my best to keep up with the younger generation, learn all the new styles, but getting deeper as the years go by. A little grey but even more powerful than a Ke$ha, Katy Perry, or Beyoncé. This past Friday I went to a party for men with beards. Yes, they happen and they are fun! Of course, I grew out my beard for it - if you're going you may as well fit the part. Sadly, there is quite a bit of grey and white in my beard these days - much more than I am happy to see. Kind of makes me feel like Santa Clause's younger brother. There are plenty of Pokémon with beards but one in particular has been sticking with me this week. Today is the launch day for Pokémon Black 2 and Pokémon White 2, so we all get to make that decision again - who will be our starter: Snivy, Tepig, or Oshawott? Let's be honest, many people are going to reclaim their starter from Pokémon Black or Pokémon White. In my case, that will be Tepig. I think most people are aware of my love of Fire types and, yes, I will be starting with Tepig. The events of the past week have got me thinking about another guy, though. Let's have a look at our friend Samurott. 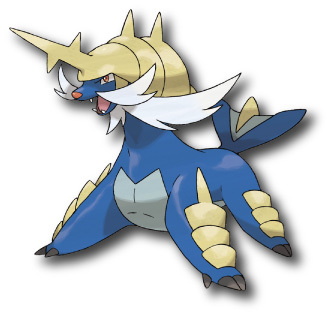 Samurott is kind of a, hmmm, well, he's the least otter looking of his evolutionary line. Definitely looks more like a sea lion than a swimming weasel! But he also has those thick white whiskers which brought him to mind this week. Out of the Generation V starter Pokémon, Snivy is the Speedy Defender, Emboar is the Slow Physical Attacker, and Samurott is the in between Special Attacker (they all have equivalent base stat totals). While you don't have a lot of control over the DNA of your starter Pokémon (unless you are a soft-resetting freak), you can breed them. As a note of caution to our more careful readers (or those in less fortunate countries than Japan and the US), I will potentially be discussing some moves that Samurott can learn in Black/White 2 that are not available in Black/White original. Consider yourself warned. Samurott's strength is in its Special Attack base stat of 108. Attack is not far behind at 100. HP is 95, Defense is 85, and Speed and Special Defense are tied at 70. He is primarily weak to Grass and Electric types and, on average, they have Special Attack as their highest stat. You have three paths you can follow - If you want to have Samurott as a physical attacker, go for an Adamant nature, sacrifice Special Attack and toss some EVs on to Special Defense to counter that weak area. If he is to be a Special Attacker, try a Modest nature and still put EVs towards Special Defense. If you are most concerned about his weakness to Grass and Electric-types, go for a Gentle or Sassy nature. If you can design your Samurott to match the moves you want to use while bolstering that Special Defense stat, you will do well. Samurott's move pool is weighted towards the physical and status categories but he has some choice special moves available to him. I prefer leveraging the slight edge he has in Special Attack and focusing on those move options. Scald and Surf provide two higher power options for you, while Hydro Cannon (a move tutor move) has high power with a slight drop in accuracy. If you have the opportunity, you may want to use Hydro Pump until you find the tutor for Hydro Cannon (slightly less powerful and slightly less accurate). I do like Ice Beam as an option which will give you coverage for Dragon, Flying, and Grass-types. The only move Samurott can learn that is super effective against Electric-types is Dig. It's there if you feel you need it! If you are using Samurott alone, you may try adding Rain Dance as a status move or Protect if you have him in a double battle. If you are calling upon Rain Dance with your Samurott, you can have him hold a Damp Rock which will extend the duration of your power boost to eight turns. Samurotts primarily come with the Torrent ability but a Dream World Samurott will come with Shell Armor. Quite simply, a Samurott with Shell Armor will never be hit by a critical hit. So often battles are brought too quickly to an end by critical hits this is a really worthwhile ability to have. Not I get to go back to playing White 2. So far, it has been great. I haven't been playing long enough for there to be much plot development but what I have seen has been amazing!